The 95 Empire space, now controlled by AS220, was the home for one of the most formidable productions in RI theater history, Perishable’s Hedwig and the Angry Inch, a punk rock opera “visiting” Providence and taking up a decadent residency in the black brick room that still has the promise of grimy theatrical possibility hanging in the air. Counter-Productions Theatre, helmed by Ted Clement and Christine Fox, have made a circuitous route from Watertown, Massachusetts, into Rhode Island (where their noteworthy Speed the Plow played at the new Artists’ Exchange space in Cranston) and have now taken up residence where Alex Platt and team brought Hedwig to life. 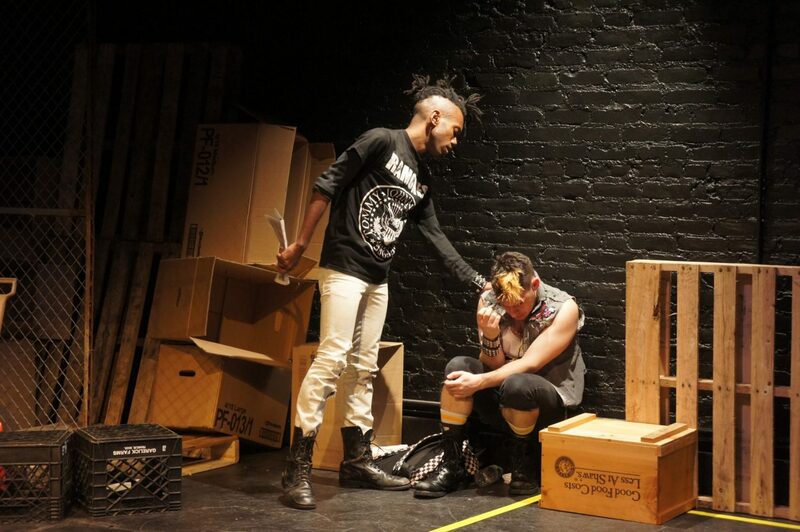 Fitting then, that Nico Was a Fashion Model, CP’s current effort, dredges up some of those ghosts and, instead of disguising 95 Empire’s grunge, embraces and augments it with a play about punk, identity and belonging. Drawing comparisons to Hedwig is not meant to make an easy comparison or to imply that Nico resides in those lofty heights, but the mood, the energy and the atmosphere are close enough to make you wish that Hedwig could come back for a double-header with a show that stands comfortably with two feet in that world. J. Julian Christopher’s original script uses the closing of CBGB’s in 2006 as a jumping off point for a story about two friends, both minorities and both punks (to varying degrees that are called into question as the storyline moves along) hoping to snag tickets to see Patti Smith close the legendary Bleecker Street venue. Luis soon meets Christa, who works at the abovementioned retail store, a symbol of suburban white middle class wealth. She is young, pretty and blonde, immediately drawing Luis’ attention as a doppelganger of Nico. It also happens that Christa was born with a tarnished spoon in her mouth as her family has ties to the genuine punk community (“Joey Ramone changed my diapers”) and she has passes to the show that night. Luis compromises his identity in order to win her favor, pronouncing his name as “Louis.” Jesse is overjoyed at the news, but once he meets Christa, her disfavor of Jesse’s color is obvious and the conflict begins. The show benefits from a great set that feels like somebody threw a bucket of sewer water on a prototype of an old scenic design from Runaways (or a particularly bad version of Rent). Projections give us the sights and sounds of CBGB’s heyday with judicious slices of Patti Smith and Debbie Harry in classic performances. The trio’s performances are mostly solid and Ron Lewis particularly stands out with a steely, edgy performance that complements the sense of comfortable displacement that his character feels. If there are any issues with Nico, they tend to be technical and/or script-related. Some of the elements seem a little forced, such as a monologue by Luis about broken glass that seems almost like it was forced into the script at a later rewrite to make sure there were enough metaphors included to elevate the literacy level. An anticlimactic scene where Luis has an asthma attack seems rushed and slightly ineffective, although this may have improved as the run continued. And, it seems that stage cigarettes are abound in several shows at present, drawing more attention to their magic-shop fakeness than their similarity to actual smoking and, at times, action slowed down while actors looked for proper places to “extinguish” the prop. This is the curse of an intimate space however, and even the clear knowledge that Paige Barry is wigged is not reason enough to want to see this entertaining and unique new script done in any other venue. Minor distractions aside, Nico delivers in its main pursuit, which is to draw attention to issues of identity and belonging in a setting that can be quite close-minded in its pursuit of anarchy. When Christa, the ostensible antagonist of the piece, tells the boys, “Neither of you know who the hell you are,” we have to agree with her. Nico was A Fashion Model presents the idea that we have opportunities in life to rise above our preconceptions. 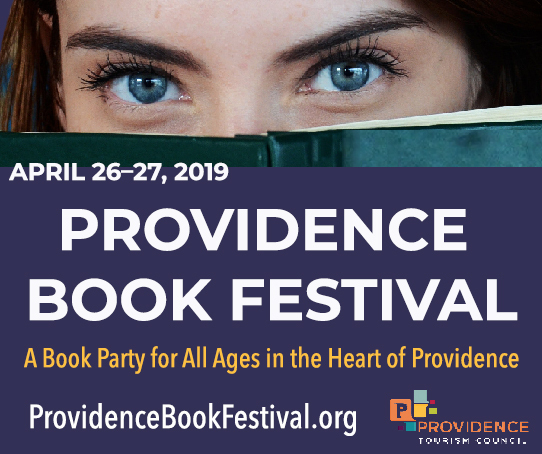 For both fans of music in general, punk in particular and all theatergoers, Nico presents an opportunity to revisit a legendary Providence performance space that, not unlike CBGB’s, has some pretty elegant ghosts in its walls. Catch it before it closes this weekend. Counter-Productions Theatre Company presents the world premiere of Nico Was a Fashion Model at the 95 Empire Black Box Theatre in Providence, RI. Directed by Ted Clement, the play features Paige Barry, Michael Flowers, and Ronald Lewis. Show dates and times are November 14, 15, 16, 21, 22, 23 at 8:00pm and November 17, 24 at 7:00pm. For further information, visit www.cptcri.com.